I've been using a very simple solar thermosyphon collector to heat my shop for several years. It is large and puts out a lot of heat -- its also simple, cheap, and low maintenance. Where we live it has a kind of amazing one year payback on the cost of materials to build it. 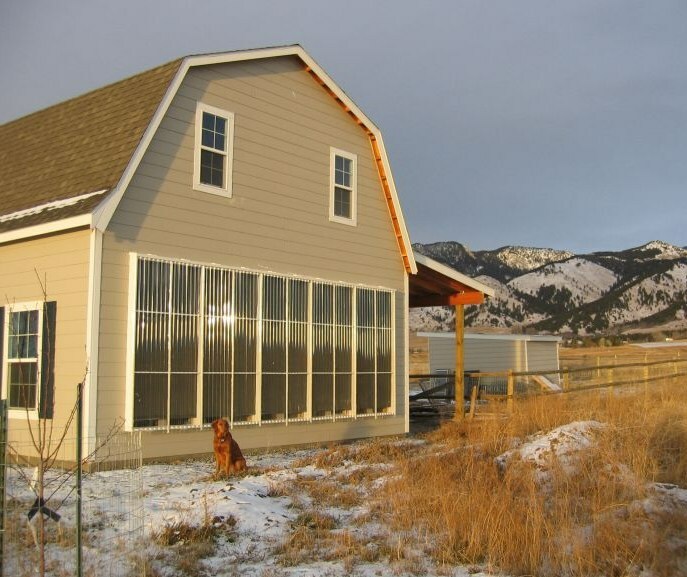 Paul House of Choice Energy here in Bozeman is offering a commercial version of the collector. He will build one on your wall for about $2000. In our climate, the collector offers about a 5 year payback (rebates could make it even shorter). This is the best rate of return I know of for commercially installed collectors by a wide margin. For example, if you compare it to the popular SolarSheat commercial collector, it is about 5 times more cost effective on a dollars per BTU basis. There is a new video in works on the collector being done by Peter and Dana. This is the first in a series of videos they are doing that will feature renewable energy projects in the SW Montana area. They were out capturing video and audio before Christmas, and the final product should be out in a month or two -- I'll post a notice when its available. I think this series of videos is going to be very interesting as there is a lot going on the renewable energy front in this area. The collector has performed very well, but, as always, there are a few things I would do differently if starting over. So, this section lists a few small changes and one large change I would make. The small changes have to do with details of the absorber installation, flashing, glazing... just small refinements. The absorber change has to do with the tilt of the screen layers. The one big possible change would be to revise the design to allow the collector to pass more daylighting into the shop area. On my other shop, I use this glazed door arrangement, and I have to say I just love the solar daylighting it provides -- it not only helps when doing work, but it also just gives the place a more pleasant feeling. I'd like to incorporate some some glazed area in the back wall of the thermosyphon collector that would add this solar daylighting feature. If you have any ideas on good ways to do this, please let me know. Paul suggested the idea of using a large hole saw to cut the inlet and outlet vents for the collector. This would save some work and look nicer. The potential downside is that a 6 inch or even 8 inch hole saw results in a smaller vent size than the design guide lines for these collectors specify. In order to get an idea what the performance penalty for the smaller vents might be, I masked down the vents on one bay, and then compared the heat output from this bay to the adjacent bay with the full sized vents. Unfortunately, there is a pretty big penalty for the 6 inch round vents, and even the 8 inch round vents show a drop in heat output. It looks like a 9 inch circular vent would be about right. While doing the small vent testing, I also had another go at testing the efficiency of the collector. I have somewhat improved instrumentation and accounted for more of the odds and ends that effect efficiency. Its difficult to get good efficiency measurements on any solar air heating collector because measuring airflow accurately is hard. Getting good airflow measurements on the thermosyphon collector is even more difficult due to the large vents with low vent velocities. But, I do think these new measurements are pretty good. Bottom line is that for the full sun, moderate winter day I tested on, the efficiency comes out between 62 and 65% -- this is really very good, especially considering how simple and inexpensive the collector design is. Logger plot used for vent size and efficiency estimates. There are also some test results on collector flow rate, dust filter effects on flow rate, and on using the back surface of the collector as a radiant room heater. Through the first 9 years, the collector maintenance has been very minimal. The poly back draft dampers have been replaced once at a cost of 2 cents per damper. I painted the outside of the collector frame last year. The fact that the collector does not have a fan or controller eliminates the two most maintenance prone items on solar air heating collectors. After 9 years, the polycarbonate glazing still looks very good. If you have any thoughts or suggestions on the collector, please let me know. Hi Gary, I really like your shop project. In fact, it inspired me to do some solar pre-planning for the shop we built a couple of years back. The shop was our launching pad to the house we're currently working on (and must finish before any "fun" projects can begin). But since you blogged about your thermosyphon, it raises a question I've had for some time and I thought I would ask it here. In your blog post, you note a large decrease in collector efficiency if there isn't really a LOT of air flow (a lot of wall openings). In your opinion, could a fan compensate for this problem? Yes, the fan adds complexity, cost and requires power - but my first question is would a fan compensate for the loss of efficiency from limited intake/exhaust ducts on the thermosyphon? The shop solar project is still at least a year away - need to finish the house first and move in, LOL! So this isn't urgent by any means, but I was just wondering if the fan is an acceptable solution to a limited duct thermosyphon. I really like your blog, thanks for the all the work I know it must take. Yes, a fan can allow you to do the collector with fewer and smaller holes in the wall. You will need to work out some form of distribution manifold along the top and bottom of the collector to distribute air evenly to the collector. With a collector as long as you have (which is great), you will need more than one place where you penetrate the wall to the collector manifold, but you certainly won't need vents every 2 ft as mine has. You might be able to do it with two places over the length of the collector. When you get to designing the collector, drop me an email and we can think about what the manifolds, ducts and fans might look like. A look at WeatherSpark might tell you how you compare with sun in other places -- there might not be as much difference as you think. instead of one large circular hole for an opening, have you thought of using several smaller ones. such as, 4x4" and 3x3". Hi -- The current collector has about 1 sf of vent area per 4 ft of collector width. I think that a pattern of small holes that that added up to that same vent area would be OK, but it would be a lot of small holes. I had hoped that the vent area could be cut back some without a big performance hit, but it looks like the large vent area is needed. 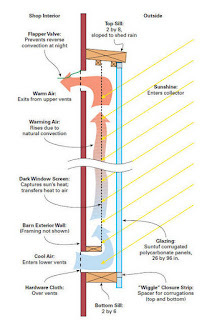 Speaking of daylighting, why did you rule out a direct gain passive solar approach? 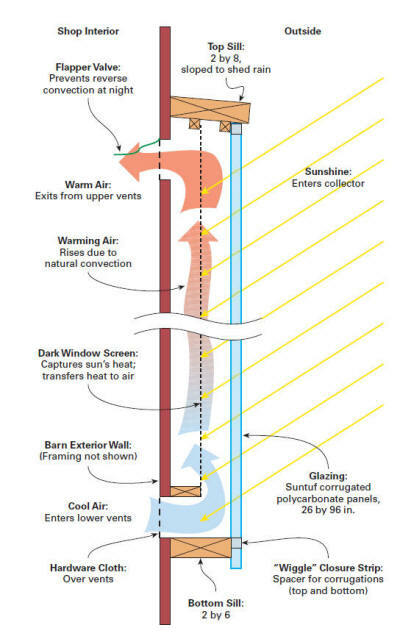 Even if the slab is uninsulated, it would work pretty well, and it's easy to retrofit slab perimeter insulation. I actually like the way this works a lot. The combination of good solar heating and good daylighting is really nice to work in. I say "sort of" direct gain because it does not suffer the high night time losses that a lot of direct gain systems do because it has the insulated garage door to serve as movable insulation. I think that this kind of movable insulation is underutilized -- its a nice solution. 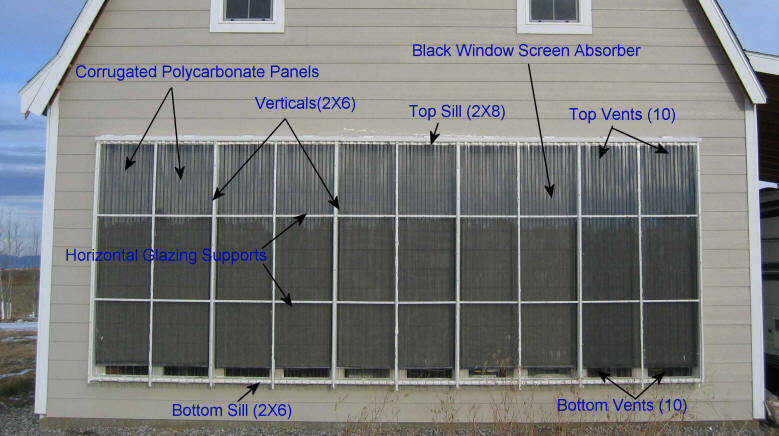 Have also been thinking about direct gain windows with thermal shades that have the power up down feature and could be automatically raised of lowered depending on whether there is enough sun to be a net gain (so, they go down automatically at night). This could be done pretty easily with the stuff that is already out there. How is the thermosyphon water heater testing coming along? I got it to freeze up by fully draining off all the warm water and filling it with city cold water, which comes in at 46F. I then covered the collectors with a tarp for two days. It froze overnight with an outdoor temperature of 4F. It thawed out in the morning with only 20 minutes of sun, and no damage was done. The thermosiphon flow starts getting strange even with a tank at 50F if it is very cold outside. Thermosiphon flow is slow, as you know, and 50F water will drop to 40F as it passes through the outdoor collector loop. When water hits 40F, it wants to reverse the normal flow direction because its density stops increasing and starts decreasing at that point. So flow just stops and it freezes up. So at this point, I wouldn't recommend it for any location that ever drops below 10F and the incoming water temperature is less than 60F. Hi Paul -- Thanks -- Really enjoy reading your blog. Hi Gary, sorry it took me so long to get back here. Thanks for the response and kind offer of design help when I start my project. I will take you up on it! Also thanks for the tip on WeatherSpark as I was not aware of that website.